Serving Dyfed and West Wales we have been installing Double Glazing products for over 35 years, with our focus squarely on the highest quality and service expectations, from initial no obligation free estimate to installation and finish. Whilst our PVCu range is by far the most popular, we also offer Aluminium and Timber Windows and Doors. Most style options are available in all three products. 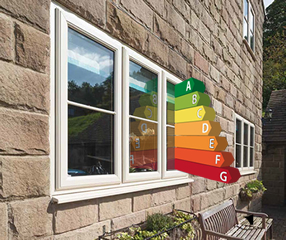 We have seen great technological advances in the Window Industry over the years: in thermal values, strength, construction, security, furniture accessories and regulatory legislation - the latest being the amendments to Part L of the Building Regulations which will state a Window Energy Rating (WER) of “C” as the minimum being obligatory. Our windows fall into the category of “C” through to “A” and are available to the conscientious homeowner keen to cut carbon emissions and heating costs, and comply with the new building regulations. We also offer a number of Home Improvements and small building works. BFRC - Whats it all about?